What are you guys getting for gas mileage on your LS3 Centri (or similar) setups? My car is a C5, but I figured your guys's numbers would be more comparable since I'm running an LS3. 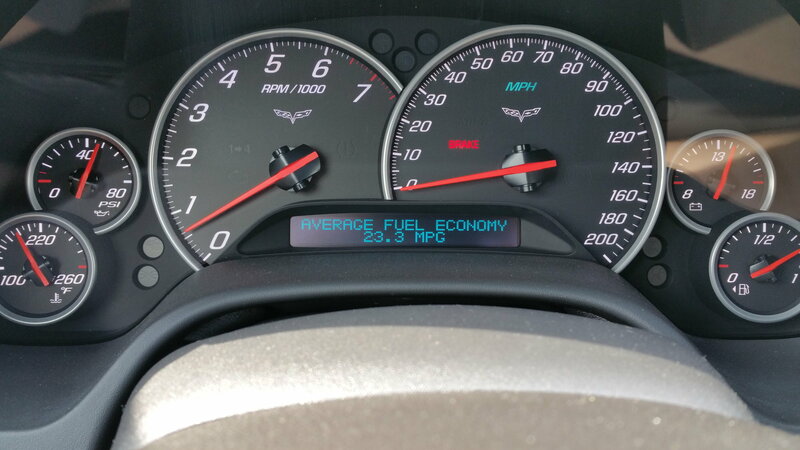 Highway mileage before the new engine and SC was 26-28mpg depending on how fast I was driving. My car is a 6 speed with 3.73 gears. Recently put an LS3 in it with a T-Trim and am getting the tuning pretty close, but my gas mileage is scaring me a little. Speedo is spot-on according to my phone's GPS app. So, I know I did a bunch of stuff that's gonna hurt my mileage, but the hit was a little bigger than I expected. I'm now at 20mpg on the highway. I was expecting about a 3-4mpg hit, not a 6-8mpg hit. Do you guys think thats about right or is there something in the tune that I can adjust to help out a little (timing in the cruise cells maybe)? I'm running SD, and closed-loop off of the factory O2 sensors. Seeing 14.7 on the wideband pretty consistently. Would turning the MAF back-on help any? I can post my tune if anyone want to check it out. Actual measured or reading off the DIC? DIC could be way off because of the injectors. The cam will hurt the mileage more than the blower. Blower is a very small. Also make sure it isn't going into PE excessively. That causes a big mileage hit. Are you going by the DIC or actually doing the math? edit: haha, beat me. Yeah. Cam will hurt MPG and going into PE too easily will as well. Last edited by schpenxel; 04-08-2019 at 04:34 PM. The widebody/wheels and tires are not helping my grandsport when stock got low 20s on the highway where my base on the same roads was in the high 20s. I just drove my car to/from Tucson and got 23mpg on the highway in my 6 speed GS. I'm cammed with an ECS 1500 on 91. Ive got a Vortec T-trim, mild blower cam, meth, headers, stroked 418 and am getting 19mpg on the highway, so im not feeling quite so bad. The 28mpg days are gone, but it pays to play and have fun, no regrets. I measured by checking mileage and doing the math at fill-ups. Ironically my DIC is actually really close to the actual numbers now. It's only off by about 1mpg, whereas before it was off by 2-3 typically. I have PE setup so that it doesn't come on at all during cruise, so I think it's good there. So, it sounds like I'm on-par with the rest of you guys then... and my giant tires are probably hurting my mileage the most. Speaking of the tires though, I've been pleasantly surprised by the traction. 345 Pilot Super Sports will hold 2nd gear once they get warm, and will almost hold 1st! in town...probably 10 or less in my car...but on the interstate 29-30 on a road trip with the cruise set at 80-85. Blower cam, YSI, and E85 I get around 200 miles to a tank. Whatever that equals. '08 base mn6 w/Procharger P1 and otherwise stock. I average 9.5-11.5mpg per tank. I can still manage 28mpg at 70mph cruise control on a flat surface, though. Damn you guys are killing some fuel mileage. I guess my commute helps keep the mileage up on mine. Even with E85 I can get over 15mpg, so call it low 20's on regular gas. C6 base LS3 600+ rwhp A&A kit, ARH 1 7/8 headers cats X-pipe A6 average 20ish mpg just normal driving. widebody kit. I CAN get 15.5 mpg on E in the city (T Trim, cam, ls6) but I like to hear my car so that doesnt happen often lol. I average around 12.5 combined. Doing about 70 mph it averaged closer to 26-27 mpg.